Casey Affleck & Girlfriend Floriana Lima Make Red Carpet Debut at Vanity Fair Oscars Party 2017! Casey Affleck proudly holds his Oscar while walking the carpet at the 2017 Vanity Fair Oscar Party at the Wallis Annenberg Center for the Performing Arts on Sunday night (February 26) in Beverly Hills, Calif. The 41-year-old actor won the award for Best Actor for his work in the movie Manchester By the Sea and he was joined by girlfriend Floriana Lima to celebrate the big win. It was the first time they walked a red carpet together! Casey was also joined by his movie’s writer-director Kenneth Lonergan, who won the award for Best Adapted Screenplay. Casey Affleck uses his time at the 2017 Film Independent Spirit Awards to get political. Casey was joined at the event by his Manchester co-star Lucas Hedges, director Kenneth Lonergan, and producer Matt Damon who was accompanied by his wife Luciana. Also spotted at the awards show was Viggo Mortensen and his Captain Fantastic director Matt Ross. Watch Casey‘s acceptance speech below. Casey Affleck, Michelle Williams, & 'Manchester' Team Celebrate Noms at Oscars Lunch! Casey Affleck and Michelle Williams walk the carpet while attending the 2017 Oscar Nominees Luncheon on Monday afternoon (February 6) at the Beverly Hilton Hotel in Beverly Hills, Calif.
Also in attendance at the event were co-star Lucas Hedges, director Kenneth Lonergan, and producer Matt Damon. Casey is nominated for Best Actor, Michelle is up for Best Supporting Actress, Lucas is nominated for Best Supporting Actor, Matt is a nominee for Best Picture as the producer, and Kenneth is a double nominee with nods for Best Director and Best Original Screenplay. Lucas flew to the west coast just for the day as he is currently in production on an Off-Broadway play in New York! FYI: Michelle is wearing Louis Vuitton. Ryan Gosling and Emma Stone take the stage together during the Directors Guild Awards on Saturday night (February 4) at the Beverly Hilton Hotel in Beverly Hills, Calif. The La La Land co-stars presented their film’s director Damien Chazelle with the Feature Film Nomination Plaque during the event. 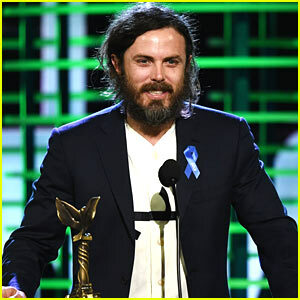 Also hitting the stage during the awards show was Casey Affleck who presented his Manchester by the Sea director Kenneth Lonergan with the Feature Film Nomination Plaque. FYI: Emma is wearing a Louis Vuitton dress. Ryan is wearing a Bottega Veneta suit. 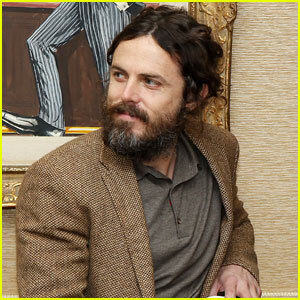 Casey Affleck has a playful relationship with his older brother Ben. The 41-year-old actor recently poked fun at him during his Palm Springs Film Festival speech. Pictured: Casey talks with Manchester By the Sea director Kenneth Lonergan at a screening and afternoon tea event held at 21 Club on Wednesday (January 4) in New York City. Casey Affleck Wins Best Actor at Gotham Awards 2016! 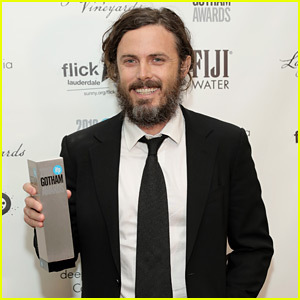 Congratulations are in order for Casey Affleck, who won the award for Best Actor at the 2016 Gotham Independent Film Awards on Monday (November 28) at Cipriani Wall Street in New York City. The 41-year-old actor was joined at the event by his co-star Lucas Hedges, who was nominated for Breakthrough Actor, and director/writer Kenneth Lonergan, who was nominated for Best Screenplay. Casey is a frontrunner for the Oscar next year and you can expect him to win many more awards this season! Also pictured inside attending the event: David Oyelowo.